On this last visit to Paris, I finally made it to Shakespeare and Company, probably the best known independent bookstore in the world. It might seem odd at first, a famous English language bookstore in Paris, just a stone’s throw from Notre Dame. But this isn’t your run of the mill Barnes and Noble– Shakespeare and Company is a Paris institution. You can’t miss the iconic yellow and green shopfront of Shakespeare and Company bookstore in Paris. Originally opened by an American in 1919, Shakespeare and Company soon became the hangout of expat authors like Hemingway, Fitzgerald, Ezra Pound and James Joyce. Over the years, the bookstore changed locations and ownership, but still feels very much like a time capsule– a little ramshackle, with shelves heaving with books and nooks hiding vintage typewriters and other artifacts. Wandering Shakespeare and Company bookstore is definitely an experience unlike shopping at those big box bookstores (and who knows how much longer even those will exist). 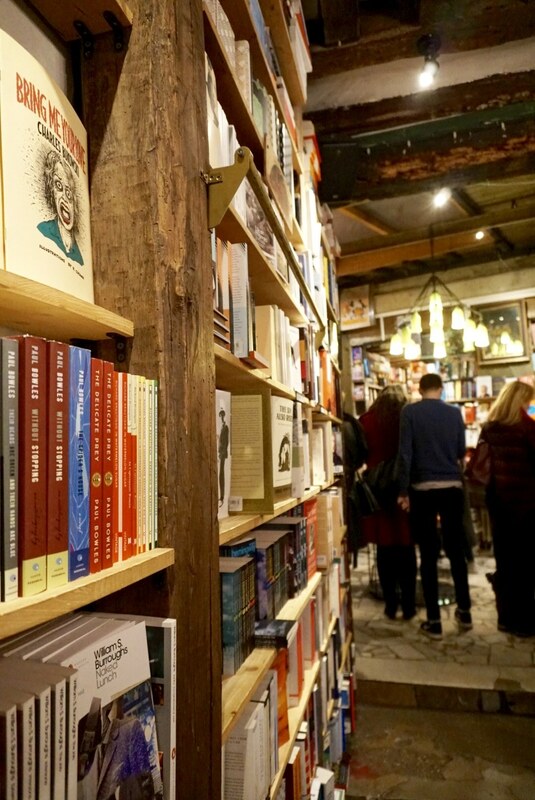 What Can you see on a visit to Shakespeare and Company Bookstore? Can you Really Sleep in the Bookstore? 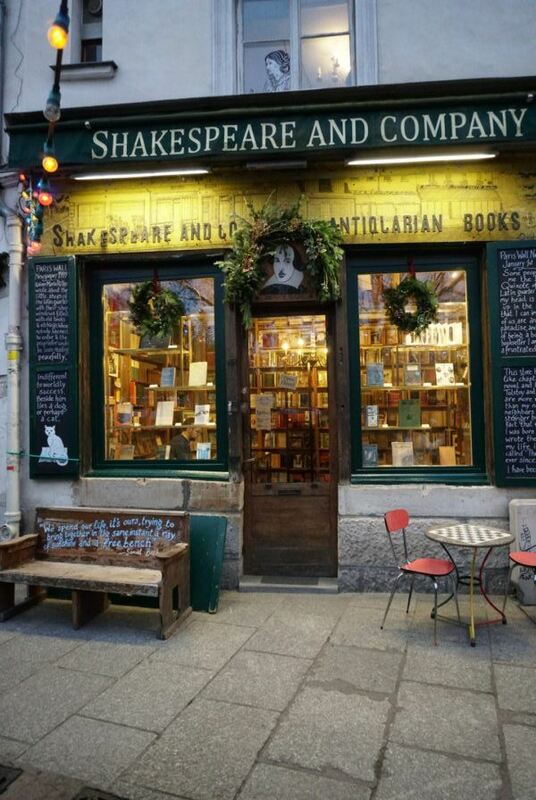 What Souvenirs Can you Bring Home from Shakespeare and Company Bookstore? Shakespeare and Company is a bookstore first and foremost, specializing in both new and antiquarian books. 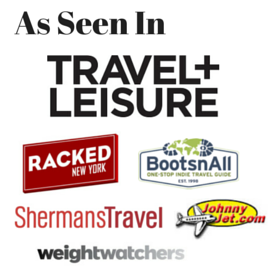 But there are a few other things you might want to look out for on your visit. Shakespeare and Company has a free reading library open to the public. Look for the famous sign “Be Not Inhospitable to Strangers Lest They Be Angels in Disguise” above the entrance to the reading library. You can also scout out the exact locations for scenes from movies filmed here– Before Sunrise and Midnight in Paris, among others. I didn’t make it up to the second floor, but I read that there is a window nook with a dead on view of Notre Dame– sounds like it might be a great place to capture an Instagram photo. Find the famous store Kitty lounging around the bookstore. 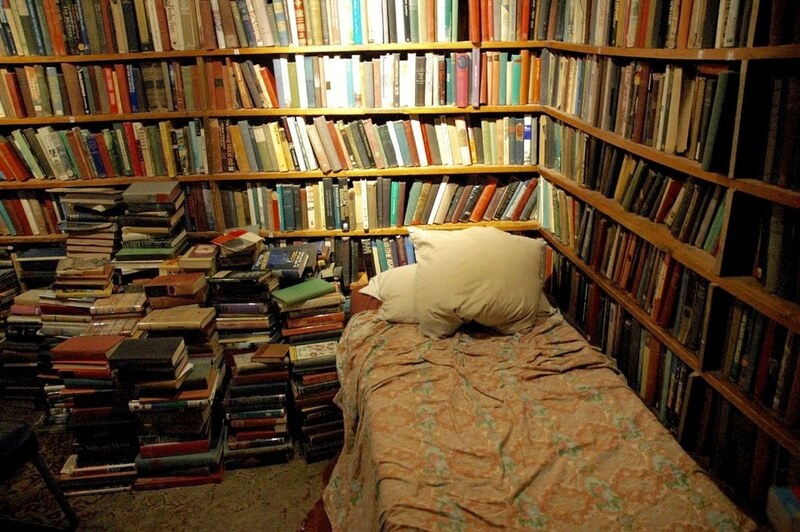 Spend the night sleeping in the bookstore, free of charge (see next section). The front entrance to Shakespeare and Company bookstore in Paris. I didn’t realize photos were prohibited until a staffer informed me. 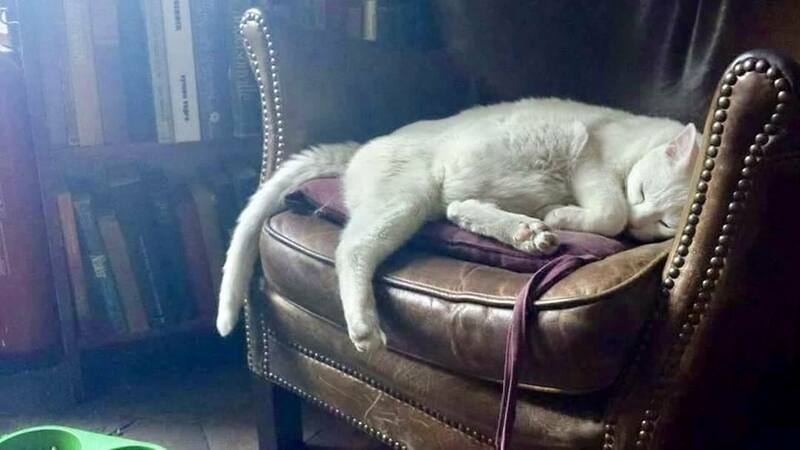 While this beautiful white Kitty no longer graces the store, a ginger Kitty has now made Shakespeare and Company her home. (photo by Lauren Sprague). I was skeptical when I read that artists and writers were invited to sleep on the benches sandwiched in between the store shelves (they doubled as beds at night). 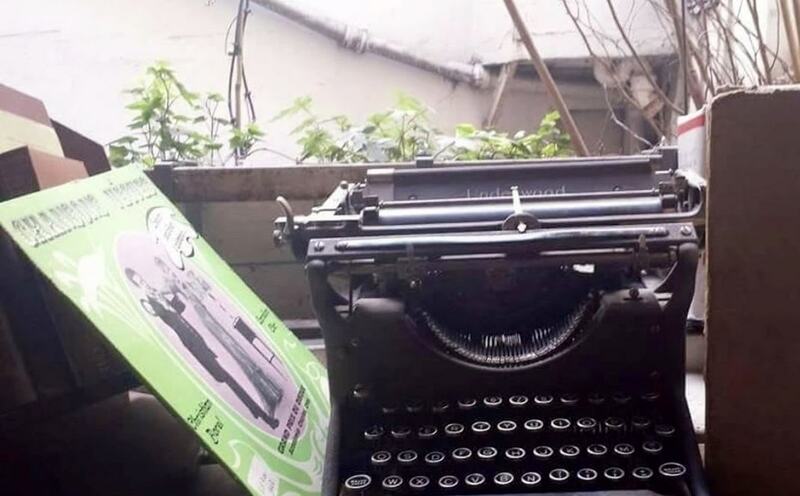 But this tradition is real– since the store opened, 30,000 writers and artists have stayed in the bookshop (including a 16-year-old Ethan Hawke). The overnight guests are called “Tumbleweeds” and are only required to read a book a day, assist at the store, and create a one-page autobiography in exchange for a bed at night. One of the beds at Shakespeare and Company, the only place I’ve heard of in Paris where you can sleep for free. 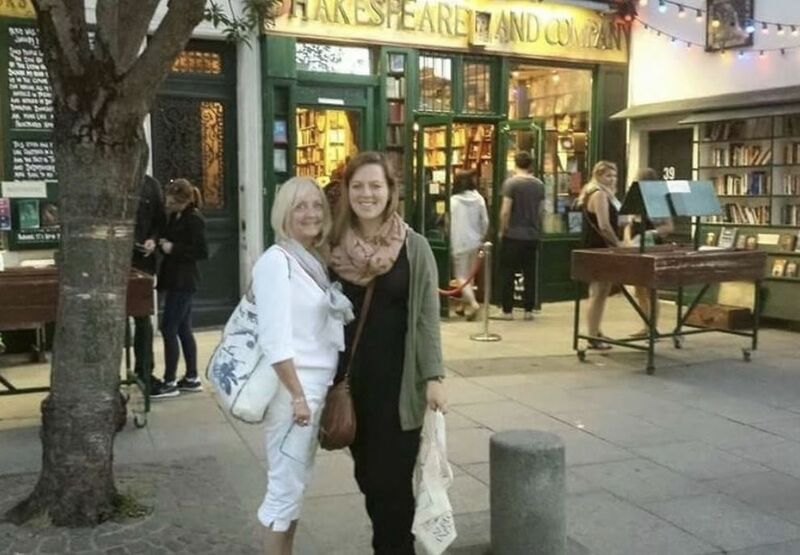 Reader Gini and her daughter Lauren visited Shakespeare and Company while Lauren attended the Sorbonne. Let’s start with the obvious. A book. Gini and Lauren bought Antoine de Saint-Exupert’s classic The Little Prince and received the official Shakespeare and Company stamp. For something a little different, The Little Paris Kitchen: Classic French Recipes with a Fresh and Fun Approach (Rachel Koo). Shakespeare and Company also sells postcards, mugs and tote bags (very popular). 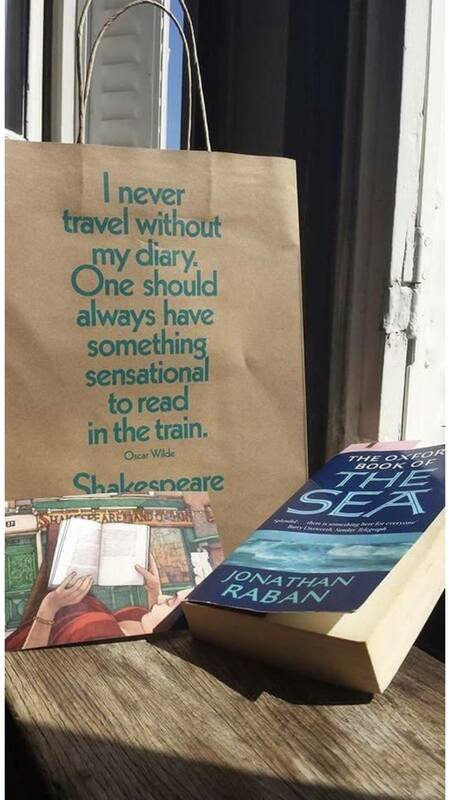 Even the shopping bags are special at Shakespeare and Company. Also featured, a book and postcard from the store. Photo by Lauren Sprague. We go to Shakespeare & Co whenever we are in Paris. Last time I bought “Breakfast at Tiffany’s” had it stamped & received one of their bookmarks . Wish I had known we could have slept there lol!!! 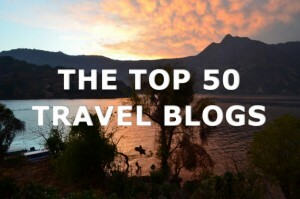 haha I just couldn’t do it– sleep there– but so curious to hear from someone who has! And Breakfast at Tiffanys seems like a perfect souvenir!